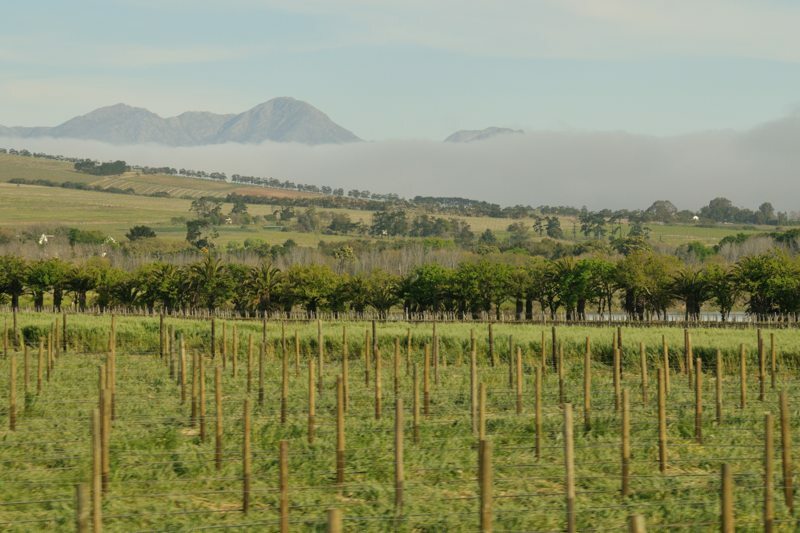 I’ve been eager to get out and spend a relaxing day in wine country and am pleased to see how quickly Cape Town dissolves into a lush landscape of gentle green hills, the mountains forming a dramatic backdrop. Our first stop is at Seidelberg Estate. It is hard to believe that is where we are, because Seidelberg has a good reputation and – almost from the moment we get off the bus – our experience is disappointing. We are greeted by a cheerful young woman who clearly knows a lot more about fashion than wine. She can’t answer the most basic of questions and the information she is able to provide seems questionable. (They replant their vines every three to seven years? Really?) In the cellar her focus is on how much cheaper it is to produce wine using all stainless steel instead of traditional French barrels. It is a fact she repeats again and again. We do our tasting amid sweeping views. It’s a lovely spot to sit and sip and, to our young guide’s credit, without having any meaningful guidance from our group (an indication that today’s tour was not well arranged), she does a good job of selecting a good selection of pleasant – even very good – wines. She isn’t particularly knowledgeable about any of them, but she has decent taste. Back on the bus, we pass the Afrikaans language monument. It is hard to miss, even at a distance. This is the first time on our trip that I’ve been confronted with an expression of pride in something (at least in my mind) closely linked to apartheid. The fact that Afrikaans may be a dying language is ok with me. I’m glad we don’t stop. There is a statue of Mandela here, where he took his first steps to freedom, but it isn’t an interesting stop. It’s incongruous, a prison in this beautiful place, but I’ve seen that before (most strikingly at Natzweiler-Struthof in France’s beautiful Vosges Mountains). This stop doesn’t add anything to what we’ve previously learned and lacks the emotional and intellectual impact of the Hector Pieterson memorial or the Mandela home in Soweto. It is an irritating waste of time and I am glad to be back on the bus again, once more traveling through the gorgeous countryside. 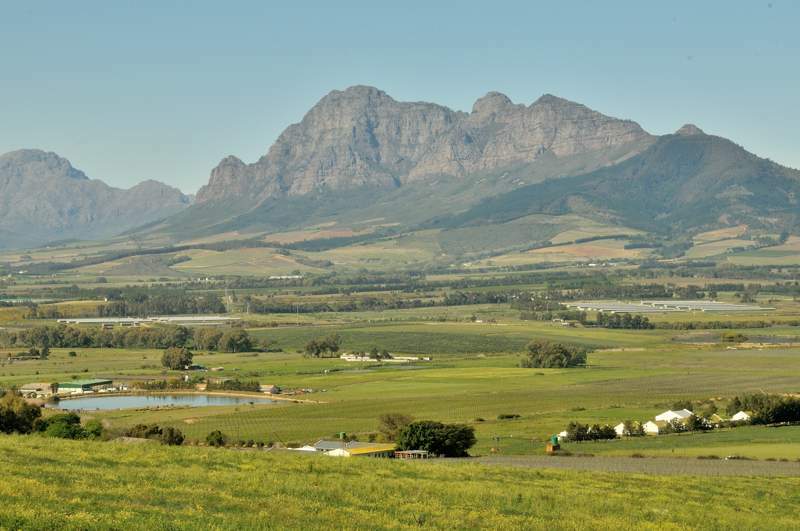 Our next stop is at Solms Delta vineyards, a picture-perfect estate at the foot of the mountains. The wines are lovely too! The tasting is well-structured and informative. It is so pleasant that our tour guide changes our lunch plans to let us linger longer over the wines before heading inside for an amazing lunch in the winery’s inviting restaurant. We get about 20 minutes (20 minutes!) to wander around pretty little Stellenbosch before we are back on the bus again. Granted, on Sunday most shops are closed, but still, this is getting to be a tedious and frustrating day – time wasted in some spots, but with far too little time in the places where I’d really like to be. I wish we had gotten a car and done this on our own. Live and learn. At least the scenery is great! Our final stop of the day is Spier vineyards, which is quite touristy, but pleasant and the tasting is interesting, engaging, and informative. It is a good end to the day.